Service Area Covered: Perth, Fremantle, Mandurah and surrounding areas, Western Australia. Remote locations in rural WA will be considered on application. 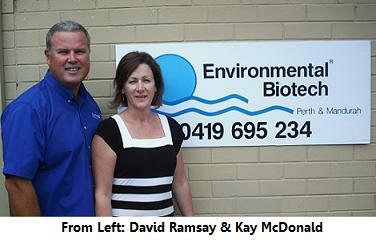 Our Franchise: Operating the Western Australian based Environmental Biotech franchise for the past 4 years. We have made successful inroads with Industrial and Commercial applications of bioremediation of greasy waste water. Some of our customers: Industrial sites include D'Orsogna Foods and QANTAS Flight Catering. Commercial sites include AMP Garden City Booragoon Food Court, Fremantle Sailing Club and Aquarama Marina.